A turning point takes place early in 1886 when Vincent van Gogh begins studies with Cormon (1845-1924) at his atelier. It is not so much the training that influences Vincent, but rather his introduction to his fellow students: John Russell (1858-1931), Henri de Toulouse-Lautrec (1864-1901) and Emile Bernard (1868-1941). Later in the year, Theo, who is working for Boussod & Valadon managing an art gallery in Montmartre, introduces van Gogh to the works of the Impressionists: Claude Monet, Pierre-August Renoir, Camille Pissarro, Edgar Degas and Georges Seurat. Their paintings have a profound influence on Vincent van Gogh and his use of colour. Later in the year, van Gogh becomes friends with painter, Paul Gauguin, a turbulent relationship that would later prove to be another turning point in Vincent's (and Gaugin's) life. SPECIAL NOTE : The painter will make the reproduction as close to the original oil painting as possible. 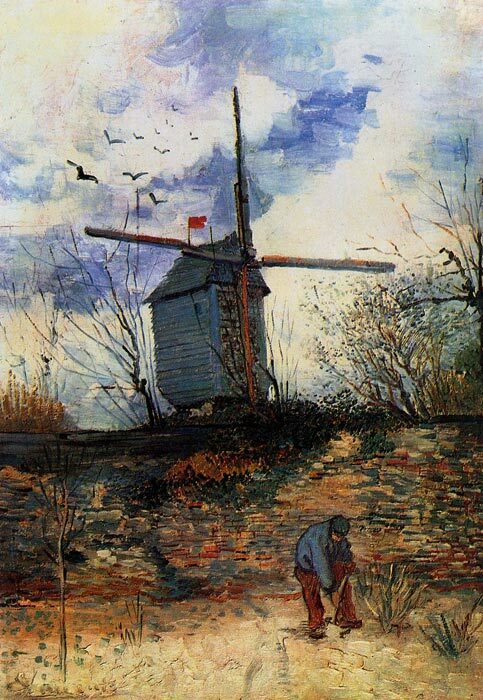 If you want your painting to alter from this likeness, please email us and " Le Moulin de la Galette, 1886 " will be reproduced according to your special requirements.